Before most musicians begin with a full-time orchestra, they likely take part in “audition season.” Winter marks the start of this nerve-wracking period; auditions for schools, pre-professional programs, and summer festivals usually occur between January and March. In addition, professional orchestra auditions start to pick up during these months, as they begin to look toward the coming season. Audition season generates a lot of stress for us and our Civic colleagues. It’s not a debilitating stress, rather, it’s the kind that makes you practice a little longer, play a few more mock auditions and record yourself more than normal. Because of this, it can be a time of really positive growth, as long as you keep your head above water! When this time of year arrives, it’s motivating and enriching to have some musical endeavors that are not orchestral excerpts. This season, the Civic Fellows have some great projects that will keep us grounded. The first thing we did when we came back from break was three days of intensive chamber music rehearsals. The Civic Fellows split into chamber groups that fit naturally with our instrumentation (supplemented by a couple of our amazing colleagues from the Civic Orchestra), and began preparing for our February concerts. Each chamber group is creating an hour-long program and presenting it at four venues throughout the city and suburbs: Stony Island Arts Bank, Indian Boundary Park, and the National Museum of Mexican Art as well as schools in the western suburbs. My brass quintet is presenting a program of American music, and we spent those three days working on Michael Tilson Thomas’ Street Song (1988), a new staple of the brass quintet repertoire. After these intensive chamber rehearsals, we were rewarded with a mid-season celebration dinner with Civic staff and administration at San Soo Gab San, a Korean BBQ restaurant on the north side of town, which was a great opportunity to unwind with each other outside of the rehearsal room. Finally, one of the biggest Fellows’ projects is now coming to fruition, our presentation based on Richard Strauss’ Don Quixote. 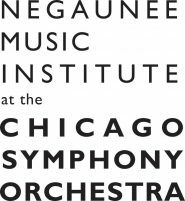 After a couple brush-up rehearsals on the week of January 16th, we will visit our partner schools starting on Monday, January 23, to perform the presentation five times throughout the week, and then later this month and early next at three Chicago Youth in Music Festival partner organizations. A lot of hard work went into preparing our presentation (like memorizing all the music, creating choreography, and developing the interactive presentation!) and we are all very excited to bring it to our audiences.